The major reason for the gain was a 46.3 percent increase in earnings to $115.8 billion. Another $30.1 billion in contributions – 70 percent of it from employers – added to the total revenue stream, offset by $46.1 billion in payouts to 1.2 million retirees. CalPERS reported a 2.4 percent profit Monday on its investments for the just-ended fiscal year, its lowest return in three years. The performance is significantly below the pension fund’s official investment forecast of 7.5 percent, and could lead to another round of rate hikes for the state and the hundreds of local governments and school districts that belong to the California Public Employees’ Retirement System. CalPERS officials, though, said a decision on rate increases is a ways off. They added that despite the low results for fiscal 2014-15, they’ve earned an average return of nearly 11 percent over the past five years and the pension fund isn’t in any immediate trouble because of one difficult year. “We are a long-term investor,” said Ted Eliopoulos, the fund’s chief investment officer, in a conference call with reporters. Choppy returns in the stock market held back the performance of CalPERS’ portfolio. CalPERS gained just 1 percent on its stocks, which make up 54 percent of the total portfolio of $300.1 billion. CalPERS’ investment performance has an enormous impact on the contribution rates charged to the state and local governments and school districts. CalPERS has been hiking those contributions by hundreds of millions of dollars annually in recent years to compensate for huge investment losses in 2008 and 2009, and to reflect larger government payrolls and predictions of longer life spans for current and future retirees. The 2.4 percent gain for the year that ended June 30 pales in comparison to the 18 percent profit earned a year earlier. While the stock holdings eked out minimal gains, the real estate portfolio earned a 13.5 percent return and private-equity investments earned 8.9 percent. The pension fund was 77 percent funded as of a year ago, the latest data available. While CalPERS has plenty of money to pay retirees for now and the foreseeable future, the funding ratio means it has 77 cents in assets for every $1 in long-term obligations. Some experts say 80 percent is an adequate funding level, while others say pension systems should be 100 percent funded. I've said it before and I'll say it again, CalPERS' investment results are all about beta. As long as U.S. and global stock markets surge higher, they're fine, but if a long bear market develops, their beneficiaries and contributors are pretty much screwed. The same goes on all over the United States which why the trillion dollar state funding gap keeps getting bigger and risks toppling many state plans over if another financial crisis hits global markets. Now, CalPERS has done some smart moves, like nuke its hedge fund program which it never really took seriously to begin with, paying outrageous fees for leveraged beta. In private equity, it recently announced that it's consolidating its external managers to reduce fees and have more control over investments. But the giant California public pension fund isn't without its critics. Even I questioned whether failure to disclose all private equity fees isn't a serious breach of their fiduciary duty. And by the way, that fellow sitting there at the top of this comment is Joseph John Jelincic Jr. who according to the first article I cited above, is an investment officer at CalPERS Global Real Estate and also member of CalPERS' Board of Directors. When I read that under his picture, I almost fell out of my chair. Talk about a serious conflict of interest. To be fair, Jelincic asks tough questions but it's simply unacceptable to have someone who works as at a public pension fund, especially in investments, to sit on its board. That's a total governance faux pas! Apart from the lack of independent, qualified board of directors, another governance problem at CalPERS and other U.S. state pension funds is the compensation is too low to attract qualified pension fund managers who can bring assets internally and add value at a fraction of the cost of going external. Sure, some big U.S. pensions are now opening their wallet to attract talent, but I remain very skeptical as the governance is all wrong (too much political interference). The California Public Employees' Retirement System (CalPERS) today reported a preliminary 2.4 percent net return on investments for the 12-months that ended June 30, 2015. 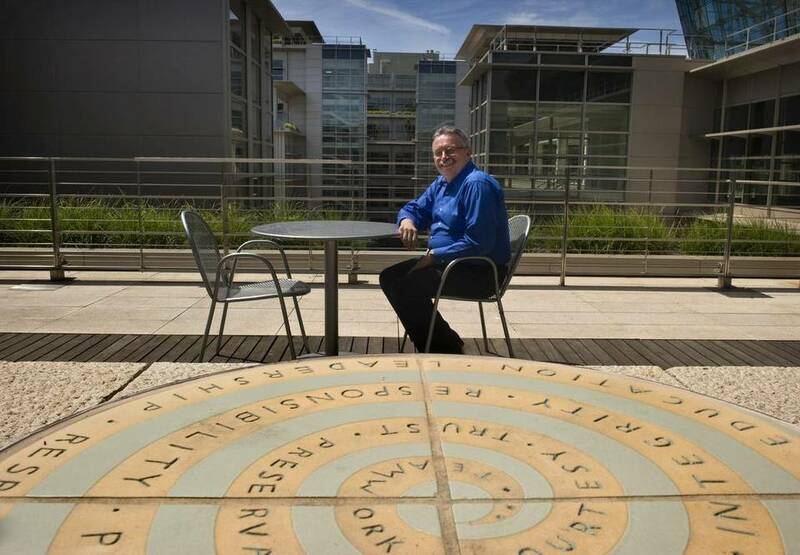 CalPERS assets at the end of the fiscal year stood at more than $301 billion. Over the past three and five years, the Fund has earned returns of 10.9 and 10.7 percent, respectively. Both longer term performance figures exceed the Fund's assumed investment return of 7.5 percent, and are more appropriate indicators of the overall health of the investment portfolio. Importantly, the three- and five-year returns exceeded policy benchmarks by 59 and 34 basis points, respectively. A basis point is one one-hundredth of a percentage point. "It's important to remember that CalPERS is a long-term investor, and our focus is the success and sustainability of our system over multiple generations," said Henry Jones, Chair of CalPERS Investment Committee. It marks the first time since 2007 that the CalPERS portfolio has performed better than the benchmarks for the three- and five-year time periods, and is an important milestone for the System and its Investment Office. CalPERS 20-year investment return stands at 7.76 percent. "Despite the impact of slow global economic growth and increased short-term market volatility on our fiscal year return, the strength of our long-term numbers gives us confidence that our strategic plan is working," said Ted Eliopoulos, CalPERS Chief Investment Officer. "CalPERS continues to focus on our mission of managing the CalPERS investment portfolio in a cost-effective, transparent and risk-aware manner in order to generate returns to pay long-term benefits." The modest gain for the fiscal year - despite challenging world markets and economies - was helped by the strong performance of CalPERS real estate investments, approximately ten percent of the fund as of June 30, 2015. Investments in income-generating properties like office, industrial and retail assets returned approximately 13.5 percent, outperforming the Pension Fund's real estate benchmark by more than 114 basis points. Overall fund returns and risks continue to be driven primarily by the large allocation to global equity, approximately 54 percent of the fund as of June 30, 2015. The Global Equity portfolio returned one percent against its benchmark returns of 1.3 percent. Key factors over the past twelve months include the strengthening of the US dollar versus most foreign currencies, as well as challenging emerging market local returns. 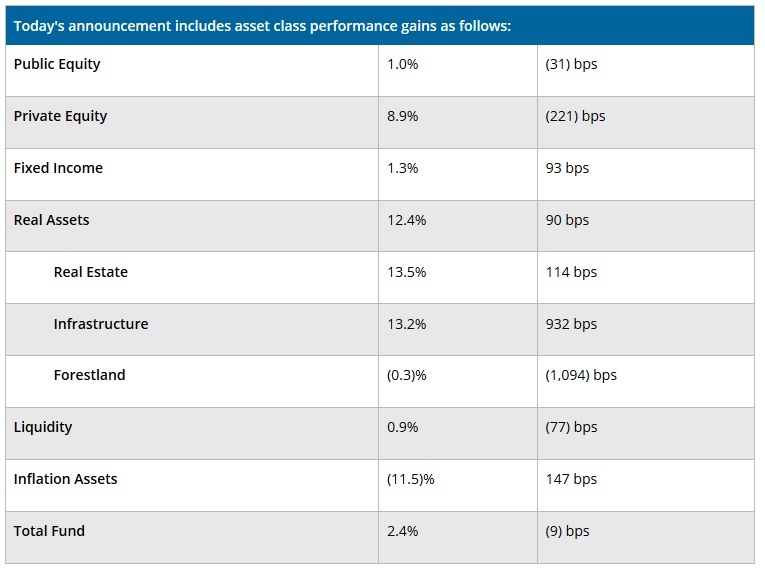 Fixed Income is the second largest asset class in the fund, approximately 18 percent as of June 30, 2015, and returned 1.3 percent, outperforming its benchmark returns by 93 basis points. Private Equity, approximately nine percent of the fund as of June 30, 2015, recorded strong absolute returns for the fiscal year, earning 8.9 percent, while underperforming its benchmark by 221 basis points (click on image). Returns for real estate, private equity and some components of the inflation assets reflect market values through March 31, 2015. CalPERS 2014-15 Fiscal Year investment performance will be calculated based on audited figures and will be reflected in contribution levels for the State of California and school districts in Fiscal Year 2016-17, and for contracting cities, counties and special districts in Fiscal Year 2017-18. Now, a few points here. First, like so many other delusional U.S. public pension funds, CalPERS is wrong to cling to its 7.5% discount rate based on the pension rate-of-return fantasy. That works fine as long as stocks are in a bull market, but with rates at historic lows, when stocks turn south, those rosy investment projections will come back to haunt them. Second, even though their fiscal years are off by a quarter, CalPERS seriously underperformed CPPIB, bcIMC, and PSP Investments in fiscal 2015. Admittedly, this isn't a fair comparison as one bad quarter in stocks can hurt overall performance and one is a large U.S. pension fund whereas the others are Canadian, but still over a one, five and ten year period, Canada's large pensions are significantly outperforming their U.S. counterparts, especially on a risk-adjusted basis. In CalPERS' Private Equity returned 8.9% in fiscal 2015, underperforming its benchmark by 221 basis points. PSP's Private Equity gained 9.4% in fiscal 2015 versus its benchmark return of 11.6%, an underperformance of 220 basis points. In other words, in private equity, both programs performed similarly except that PSP's Private Equity program invests a lot more directly than CalPERS' and pays out significantly fewer fees to external PE managers (they do invest in funds for co-investment opportunities). In Real Estate, CalPERS returned 13.5% in fiscal 2015, outperforming its real estate benchmark by 114 basis points. PSP's Real Estate significantly outperformed its benchmark by 790 basis points (12.8% vs 4.9%) in fiscal 2015. Again PSP invests directly in real estate, paying fewer fees than CalPERS, but clearly the benchmark PSP uses to gauge the performance of its real estate portfolio does not reflect the risks and beta of the underlying investments. The same can be said about PSP's Natural Resources which far surpassed its benchmark return (12.2% vs 3.6%) while CalPERS' Forestland significantly underperformed its benchmark in fiscal 2015 by a whopping 1094 basis points (not exactly the same as forestland is a part of natural resources but you catch my drift). I think this is why CalPERS is divesting from these investments. 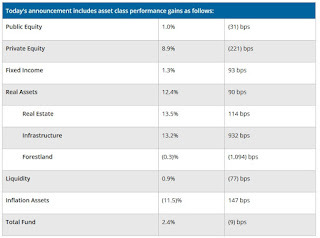 Only in Infrastructure did CalPERS significantly outperform its benchmark by 932 basis points, gaining 13.2% in fiscal 2015. By comparison, PSP's Infrastructure gained 10.4% vs 6.1% for its benchmark, an outperformance of 430 basis points. Again, I don't have issues with PSP's Infrastructure benchmark, only their Real Estate and Natural Resources ones, and just like CPPIB, the Caisse and other large Canadian pensions, PSP invests directly in infrastructure, not through funds, avoiding paying fees to external managers. It goes without saying that no investment officer at CalPERS is getting compensated anywhere near the amount of PSP's senior managers or other senior managers at Canada's large public pension funds (Canadian fund managers enjoy much higher compensation because of a better governance model but some think this compensation is extreme). I better stop there as I can ramble on and on about comparing pension funds and the benchmarks they use to gauge the performance of their public and private investments. I'm still waiting to hear about that other large California public pension fund, CalSTRS, but their annual report for fiscal 2015 isn't available yet. I don't expect the results to be significantly different from those of CalPERS and it too is embroiled in its own private equity carry fee reporting scandal. Hope you enjoyed reading this comment. As always, please remember to click on my ads and more importantly to donate or subscribe to this blog via PayPal at the top right-hand side. Below, I embedded the latest CalPERS' investment committee board meeting on June 15th, 2015. For a pension and investment junkie like me, I love listening to these board meetings. I think you should all take the time to listen to this meeting, it's boring at parts but there are some great segments here and I applaud CalPERS for making these board meetings public (good governance). I also embedded the video of the classic song, California Dreamin', featuring The Mamas and The Papas. Keep dreaming California but when markets turn south, you're in for a very rude awakening.